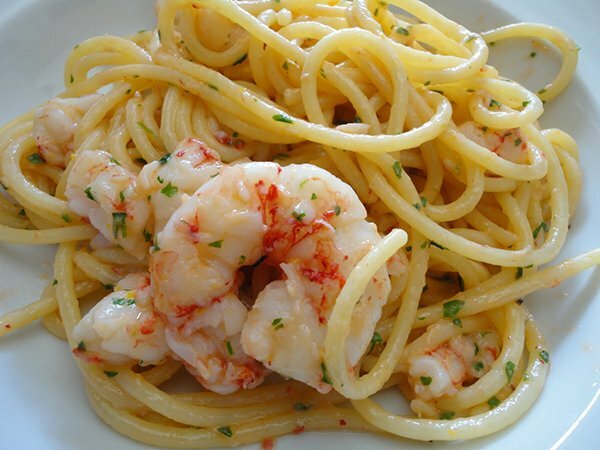 Sicily, just like Italy, is famous for its food, especially its Street Food. While in many countries around the world many people go to the usual fast food shops for their breakfast or lunch break, here there are places where you can still find good traditional local food. Sicily is one of those places where you do have some fast food chains but the local Bar, a mix between a coffee shop and a pub, is still the place where the locals go for their Espresso coffee or their Panino (sandwich). You just have to walk into any of these family run places and you will see the variety of food and sweets to fill your eyes before filling your belly!. 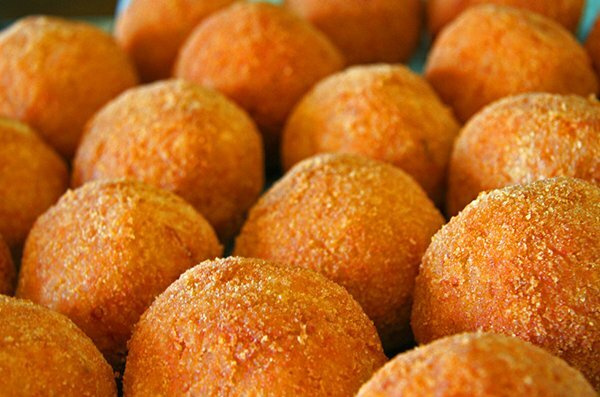 Sicily’s most famous snack is the ARANCINA, as they say in Palermo, or ARANCINO, as they say in Catania. A fried rice ball covered in toasted bread crumbs with two kinds of fillings. One is “Con Carne” (with meat), that is with minced meat, peas, and tomato sauce. The other one is “Con Prosciutto” with ham and mozzarella cheese. According to some it has Arab origins, but to be honest with you, I don’t think that is the case. For two simple reasons. The first one is because tomatoes were brought to Europe from the Americas by Columbus, the second is that Muslims don’t eat ham! The third one is you don’t find Arancine (plural for Arancina) on the other side of the Mediterranean. Of course a proper meal is by far more important to any Italian than a quick snack. Therefore those who can, and they are many, go back home for lunch and have a traditional dish of PASTA followed by a salad and fruit or, for those who are really hungry, a steak or fish always nibbling bread, topped with an espresso coffee. As far as pasta is concerned I would like you to pay attention to what I’m going to say: “We do not always eat Pasta Bolognese”, actually we don not call it Bolognese. We call it PASTA CU CAPULIATU (in Sicilian) that is PASTA CON RAGÙ (in Italian), translated Pasta with minced meat, peas, carrots and tomato sauce, DELICIOUS!!). Another thing, we DO NOT put Meat Balls on top of our spaghetti! They are two different dishes! Spaghetti is the main course and meat balls is the second. Sorry, but I had to say it, I had to get it off my chest!! We have pasta with all the veggies and legumes which makes Sicilian, and Italian cooking, very vegetarian! You should try pasta with lentils, or with peas, or with broccoli, or with chick peas, or with beans. You could also try pasta with egg plant, or zucchini (Sicilian zucchini), or pasta with Zucca (pumkin), or simply with tomato sauce or even better, PASTA CU L’AGGHIA E L’OGGHIU, pasta with garlic and olive oil with a sprinkle of pecorino or parmesan cheese. Depending on the season you come ask for the typical pasta of that season, you won’t regret it! By the way, Sunday lunch is taken very seriously around here and the main dish is PASTA AL FORNO (oven baked pasta) which is different from LASAGNE AL FORNO. Anyway only in Palermo will you find Pasta al Forno made with Ring Pasta. You won’t find it in any other town around Palermo or in Sicily, let alone in Italy. Finally, PASTA CU PISCI (pasta with fish, in general). Obviously, not all fish goes well with pasta but some do. Pasta with GAMBERETTI (prawns), or with COZZE (mussels), or with TONNO, tuna fish. Actually, the list is quite long. Remember to order fish that is fished in that period of the year, and possibly locally. Many fish restaurants are supplied by the local fishermen. 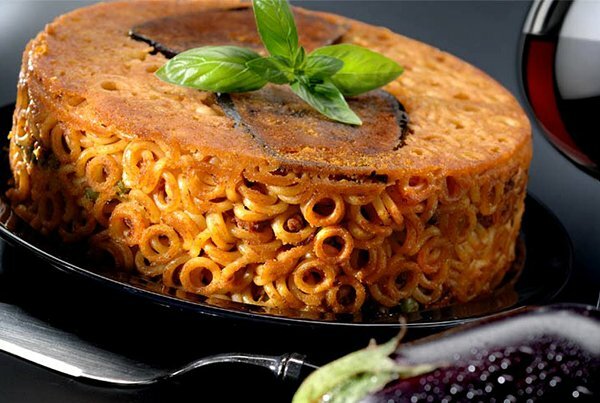 Of all the pasta dishes with fish PASTA CHI SARDI CU FINOCCHIU SARVAGGIU (pasta with sardines with wild fennel) is the most popular and most representative of Palermo. You should even try PASTA CON NERO DI SEPPIA, that is spaghetti with squid’s black ink! In many restaurants you will find grilled fish, Sword fish and Tuna fish (seasonal) and fried Calamari besides boiled octopus. If you are a true vegetarian you MUST have our delicious CAPONATA. I will not go into too many details but if you order it ask if it is made by the chef himself/herself and remember it must be served cold. 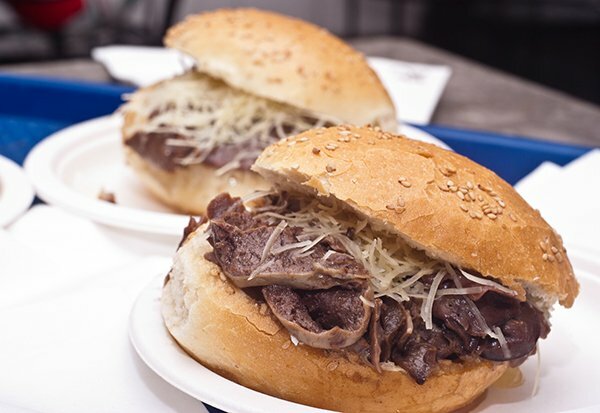 Going back to our Street Food , Palermo is in the top 5 positions for the Best Street Food in the World. A Classical Palermitan meal is PANI CA MEUSA, literally bread with spleen, which can be also SCHETTA or MARITATA (single or married), meaning with or without cheese. Then we have PANE E PANELLE , bread with chick pea flour fried pancakes. My favourite!! I could carry on but I believe that the less I say the more you will be surprised when you get here and I’m not going to mention our wine either. It speaks for itself! Just one last tip, if you are in a local trattoria or family run restaurant ask for their local food and their traditional dishes, besides their own wine, you will be surprised! Shall I mention our sweets and cakes? 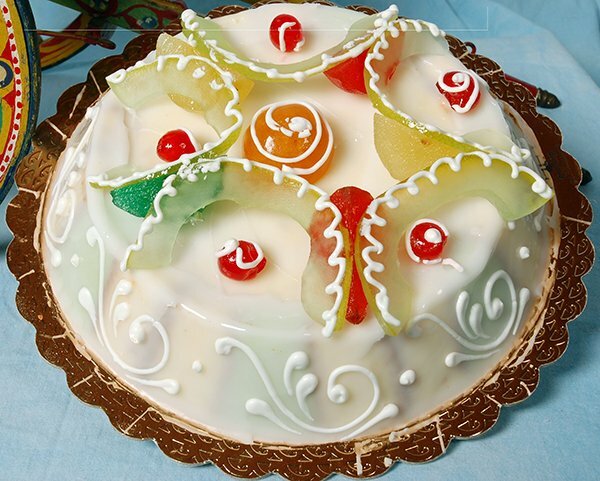 CASSATA SICILIANA or MARTORANA FRUIT ? The former is made mainly with sugared ricotta cheese, while the later is made with sweet marzipan. I was forgetting about our ICECREAM. Well, what can I say, come and try for yourself! But you will have to try our BRIOSCIA CU GELATU ice-cream in a sweet bun. What about Pizza? What can I say, just try it when you get here. Palermo’s traditional Pizza is called SFINCIONE. Actually it’s not a true Pizza, it has a thick soft base topped with a thick layer of tomato sauce with onions. Yummy! !